The Harwich Desk Clock is the perfect-size timepiece for any desk - home or office. Measuring 2.2” in diameter, this handsome quartz clock is crafted from solid forged brass, and features a classic, easy-to-read dial. The case of this timepiece offers ample room for engraving on its top and back. Available in two additional finishes: Nickel and Black Titanium. 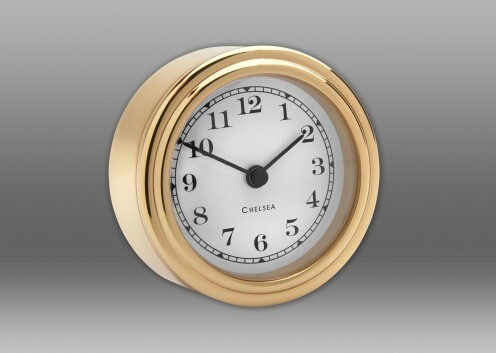 Chelsea Clock offers world class customization services which are ideal for gift giving, award presentations, and marking milestones and achievements. 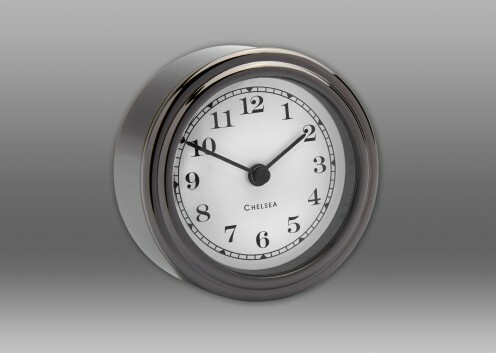 Options range from engraving on clock cases and plates to screen printing company logos on dials. Please see below for samples of some of our most popular personalization choices. Click here for samples of engraving messages. Please contact our sales department at 866-899-2805 or sales@chelseaclock.com with questions or to discuss engraving options in further detail. 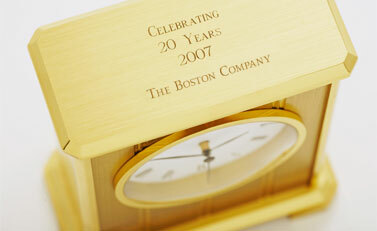 Inscribe a custom message in the font of your choice directly on a clock case or plate. A variety of traditional and script fonts are available. Receive up to 5 lines of engraving for $25.00. For a timeless and unique look, we will engrave your company logo with a blackened treatment directly on a Ship's Bell Clock's dial. A one-time artwork charge of $80.00 applies, as well as a $15.00 per piece run charge. 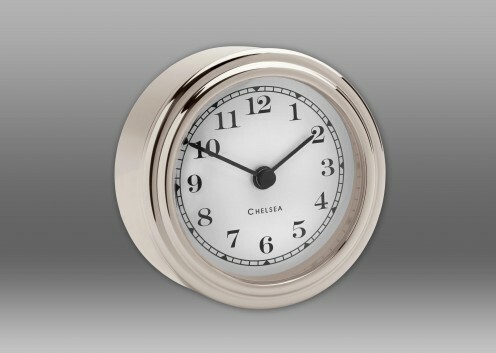 Subtle yet distinctive, logos can also be engraved directly on a clock case or plate. A $80.00 one-time artwork charge applies, as well as $15.00 per piece run charge. Add an additional $25 for up to 5 lines of text engraving. Made from high quality solid brass in a variety of styles and sizes, our engraving plates can be custom engraved with a message or logo of your choice. Finishes are available in both solid brass as well as nickel. Options will vary depending on the clock or base. See Accessories for more information. Receive up to 5 lines of engraving for a flat fee of $25.00. Signatures may be scanned, digitized and engraved to the plate or clock case of your choice. Monograms are available in a variety of script and traditional fonts. Receive up to 5 lines of engraving for a flat fee of $25.00. A $15.00 charge applies for each signature or monogram. Note, logos may be added for an additional art charge of $80.00. Most Chelsea Clock dials can be screen printed with logos in multiple colors, a stunning presentation for company achievement and retirement awards. Camera-ready artwork is required on a plain white background as well as any required PMS colors. Artwork may be submitted via Email to sales@chelseaclock.com as a PC formatted DXF, JPEG, TIF, BMP, EPS OR GIF file. A $125.00 one time art charge, $95 one time per color scan charge as well as a $9.00 per color, per piece run charge applies (10 Piece Minimum).